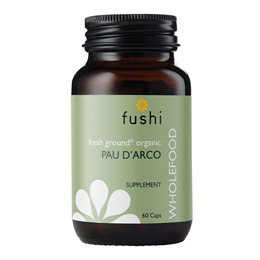 Pau D`Arco is rich in selenium, iron, calcium, magnesium, potassium, sodium and vitamins A, B-complex and C. These nutrients give it an antibacterial, antiviral, and antifungal action. The selenium content is beneficial in fighting yeast infections. Freshly Ground Tabebuia Impetiginosa (Pau D`Arco), Pullulan Capsules (Aureobasidium pullulans). 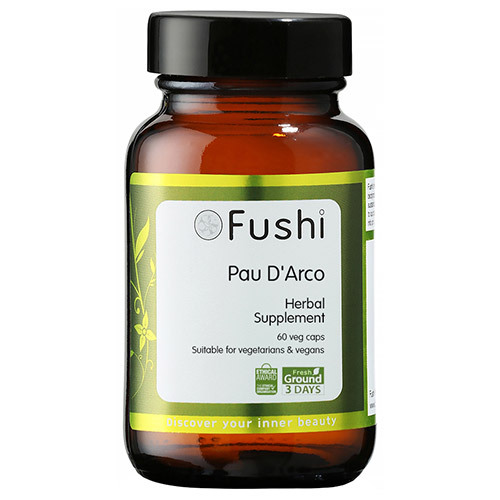 Below are reviews of Fushi Organic Pau D`Arco - 60 Vegicaps by bodykind customers. If you have tried this product we'd love to hear what you think so please leave a review. I read about this on the Dr. Mercola site and it sounded useful. I bought two lots and am just coming to the end of the first bottle. I'm not sure if it's done anything beneficial at this point but I think it's responsible for the slight nausea I've experienced and I'm sure it's affected my bowels. I only take 2 a day as we only eat 2 meals but I've noticed when I don't take it I don't feel the nausea. It's not bad but it seems to affect my appetite too. I'll keep going as I personally think sometimes it takes longer than 30 days for some things to take effect.